Contains a wide selection of tools to cover most maintenance tasks. 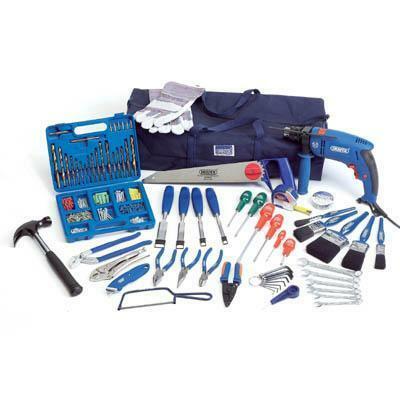 With emphasis on general tasks, this kit contains tools to tackle most basic carpentry, electrical and fixing jobs. From putting a shelf up to painting a window - it's all here! Hammer drill, trimming knife, 6 piece combination spanner set, waterpump pliers, self-grip pliers, wire stripper, junior hacksaw with blade, drill and plug set, 255mm hand saw, pointed awl, measuring tape, insulation tape, gloves, 3 piece pliers set, 6 piece screwdriver set, 8 piece hex key set, claw hammer, 5 paint brushes, 4 piece wood chisel set, tool bag.